It has been a very interesting couple of weeks for me, going through the GAPs protocol. The GAPs (gut and psychology syndrome) protocol is a short term diet that can heal a lot of autoimmune diseases. I decided to go through it due to joint inflammation that just seemed to never want to go away. I was expecting it to be a lot tougher than it has been, since it is known to be one of the most restricted diets ever. My meals consisted of homemade bone broth, fermented sauerkraut, kefir, soup, and honey. Note that this is a short term diet that is intended to heal the gut, and a lot of digestive, autoimmune and mental disorders. I am all about experimentation! I did experiment with a lot of soups, something I don’t do quite often. I also fell in love with butternut squash and eat it every single day now. It’s such a yummy, filling vegetable. This week was stage 2 of the Intro diet, and I added eggs, pancakes, and roasted chickens. I have to say that the inflammation faded since day 1. My bloating went away and I feel really relieved from a lot of digestive issues I was having. 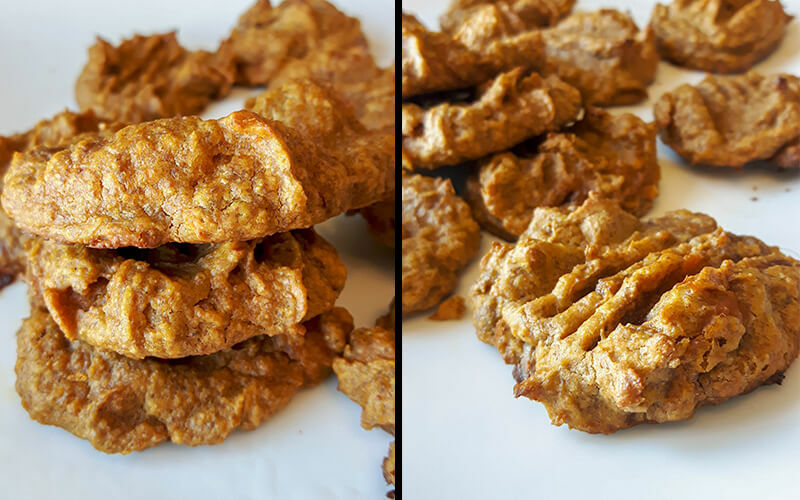 This recipe is ridiculously easy and simple. 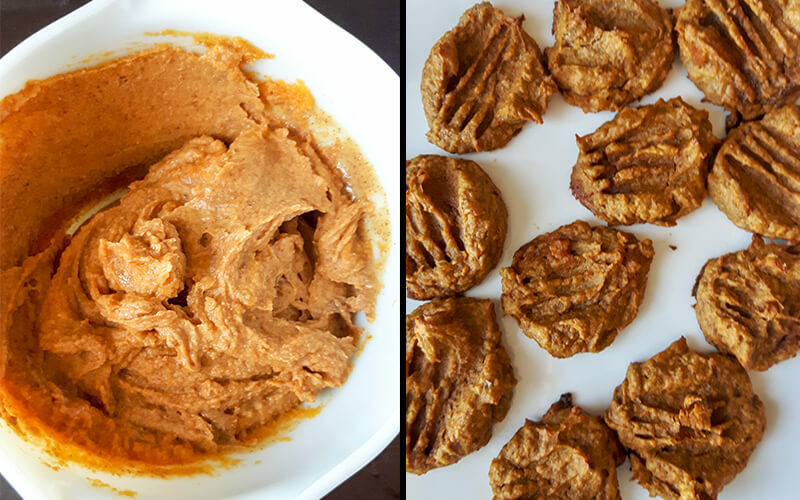 If you have a nut butter at home and some pumpkin puree, you are good to go. You can also use butternut squash for this as well. I’d be interested to know how it turns out! Scoop the mix with a teaspoon into the parchment paper. Use a fork to press on the mounds. 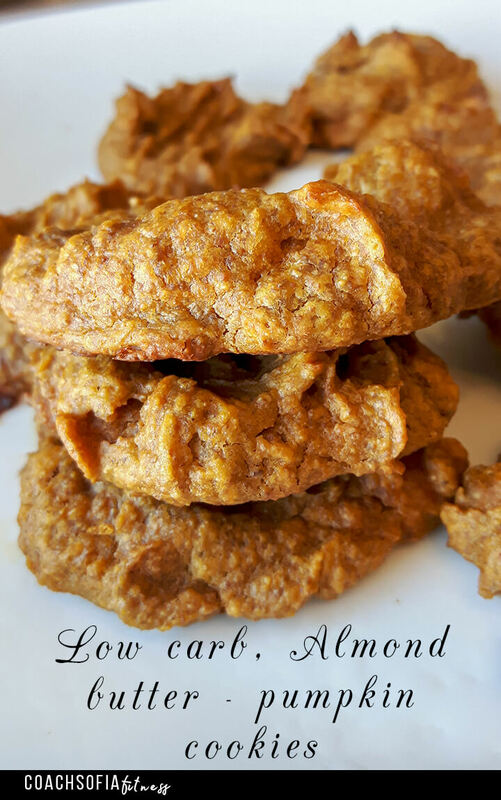 You guys, this low carb almond butter pumpkin cookies recipe is so awesome and super easy. It takes me less than 5 minutes to combine all the ingredients and another 15 to bake. Bake them at 350°F 🙂 Then remove them from oven and let them sit for few minutes. What are the net carbs per cookies if erythritol is used to sweeten the cookie dough? Did you use enough almond butter? I have made them many times and they always turn out like the photos. Perhaps it’s the puree brand. I’d like to share information I learned during my Dallas area workplace’s outbreak of an airborne infectious disease that can cause malignancies, precancerous conditions, rheumatological diseases, connective tissue diseases, autoimmune symptoms, inflammation in any organ/tissue, seizures, migraines, mood swings, hallucinations, etc. and is often undiagnosed/misdiagnosed in immunocompetent people. Of course, some of it you may already know. My coworkers and I, all immunocompetent, got Disseminated Histoplasmosis in Dallas-Fort Worth from roosting bats, the most numerous non-human mammal in the U.S., that shed the fungus in their feces. The doctors said we couldn’t possibly have it, since we all had intact immune systems. The doctors were wrong. Healthy people can get it, too, with widely varying symptoms. And we did not develop immunity over time, we’d get better and then progressively worse. This pathogen parasitizes the reticuloendothelial system/invades macrophages, can infect and affect the lymphatic system and all tissues/organs, causes inflammation and granulomas, etc. It causes idiopathic (unknown cause) diseases and conditions, including hematological malignancies, autoimmune symptoms, myelitis, myositis, vasculitis, panniculitis, dysplasia, hyperplasia, etc. It causes hypervascularization, calcifications, sclerosis, fibrosis, necrosis, eosinophilia, leukopenia, anemia, neutrophilia, pancytopenia, thrombocytopenia, hypoglycemia, cysts, abscesses, polyps, stenosis, perforations, GI problems, hepatitis, focal neurologic deficits, etc. Many diseases it might cause are comorbid with other diseases it might cause, for example depression/anxiety/MS linked to Crohn’s. Researchers claim the subacute type is more common than believed. It is known to at least “mimic” autoimmune diseases and cancer and known to give false-positives in PET scans. But no one diagnosed with an autoimmune disease or cancer is screened for it. In fact, at least one NIH paper states explicitly that all patients diagnosed with sarcoidosis be tested for it, but most, if not all, are not. Other doctors are claiming sarcoidosis IS disseminated histoplasmosis. The fungus is an Oxygenale and therefore consumes collagen. It’s known to cause connective tissue diseases, rheumatological conditions, seizures, and mental illness. Fungal hyphae carry an electrical charge and align under a current. It causes RNA/DNA damage. It’s known to cause delusions, wild mood swings (pseudobulbar affect? ), and hallucinations. It’s most potent in female lactating bats, because the fungus likes sugar (lactose) and nitrogen (amino acids, protein, neurotransmitters?). What about female lactating humans…postpartum psychosis (and don’t some of these poor women also have trouble swallowing)? The bats give birth late spring/summer, and I noticed suicide rates spike in late spring/early summer. It’s known to cause retinal detachment, and retinal detachments are known to peak around June-July/in hot weather. A map of mental distress and some diseases appear to almost perfectly overlay a map of Histoplasmosis. Johns Hopkins linked autism to an immune response in the womb. Alzheimer’s was linked to hypoglycemia, which can be caused by chronic CNS histoplasmosis. The bats eat moths, which are attracted to blue and white city lights that simulate the moon the moths use to navigate. Bats feed up to 500 feet in the air and six miles away in any direction from their roost, but not when it’s raining or when the temperature is less than approximately 56° F.